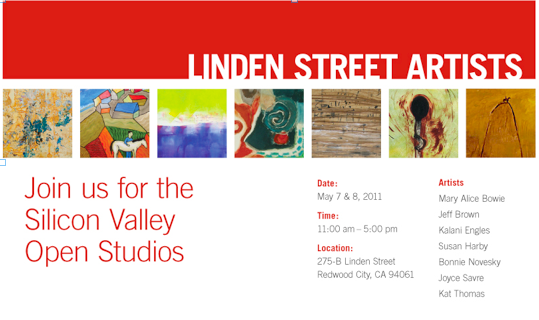 Seven Linden Street Warehouse artists will open their studios to the public during Silicon Valley Open Studios on May 7 & 8. Paintings, sculpture, prints, photography and textiles will be on display from 11:00 AM until 5:00 PM each day. Visitors will be able to learn firsthand from the artists how their work is created and have an opportunity to choose from a wide selection of fine pieces should they wish to buy. Light refreshments will be served. The Linden Street Warehouse is located at 275 B Linden Street, directly behind the mattress store on El Camino Real across from Target, Redwood City.